The Alaska Redistricting Board will hold a public meeting in Ketchikan on March 26th to discuss the upcoming reapportionment. The board is responsible for redrawing Alaska’s legislative districts every ten years after the federal census. The meeting will be held at the Ketchikan Gateway Borough Assembly Chambers at 12pm, and will offer a chance for public comment. Additionally, the board will conduct a public hearing via statewide teleconference on March 31. 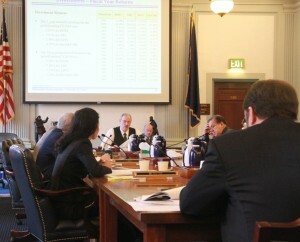 This week the Senate Finance Committee is reviewing the Governor’s FY12 Capital Budget. The Governor’s budget proposes spending over $1.6 billion on infrastructure investments, including $645 million from the state general fund. Capital spending stimulates private sector employment and has a tremendous impact on Alaska’s local economies. With a weak national economy, soft housing market and stagnant job growth, this year’s budget is especially critical. This budget will be developed with full public participation. These projects were vetted in an unprecedented, open and deliberative process. On Thursday March 17th from 5pm-8pm the committee will be hearing public testimony on the proposed budget. If you wish to participate please visit your local Legislative Information Office (LIO). I look forward to hearing from Alaskans and working with colleagues to address our state’s infrastructure needs. I’m pleased to welcome Southeast Conference to Juneau this week for their annual Mid-Session Summit. Southeast leaders are in town to discuss issues vital to Southeast, Alaska including energy, transportation, tourism, economic development and a host of other topics. We are pleased to have them in Juneau, and I appreciate their service. This past week I attended the Energy Council’s annual meeting in Washington D.C. The meetings were a great opportunity to discuss energy policy and update policy-makers on issues important to Alaska. While in Washington, I joined a delegation from Sitka to speak with the Federal Energy Regulatory Commission (FERC) regarding Southeast Alaska hydroelectric projects. I also met with Alaska’s Congressional Delegation, and had meetings at the Department of the Interior and the White House. It was a very productive and fast-paced trip. I’ve served on the Energy Councils’ executive committee for several years, and consider the conference a key part of our continued efforts to develop Alaska’s energy resources. Recently the Senate Finance Committee received a briefing on the status of Alaska’s public retirement system. The state retirement and benefits program supports nearly 70,000 Alaskans, and constitute our state’s largest public trust accounts. During the past ten years, Alaska’s retirement system has faced several complex and daunting financial challenges. It’s important to understand the significant liabilities our state’s pension system faces, and the reforms the legislature adopted. Ensuring the health of Alaska’s public retirement system has been one of my top legislative priorities. In 2005, I took a lead role changing the state’s retirement plan and establishing the defined contribution system for teachers and public employees. At the time, our state’s retirement system faced a surprising $5.7 billion unfunded pension liability. In response, the legislature has taken a series of decisive steps to address the problem. Over the last 7 years, the legislature has deposited $1.6 billion into the PERS/TRS retirement trusts. We also capped local retirement contributions at 22% of payroll. This helped prevent excessive employer contribution rates from devastating school budgets and crippling Alaskan communities. Providing this financial relief also averted substantial increases in property taxes on Alaskans. Despite significant reforms, our state’s pension system remains only 63% funded for public employees (PERS) and 54% funded for teachers (TRS). Alaska’s unfunded pension liability is over $11 billion. For the FY12 budget, the state’s required contribution will be another $478 million, an increase of $120 million over last year. Within 10 years, the state’s required payment is expected to exceed $1 billion annually. While the Legislature is responsible for funding these public benefits, their cost is shared by every Alaskan and I do not support reversing the positive reforms we’ve made to the retirement system. It’s critical that we attract and retain excellent teachers and public employees. We owe these hardworking employees competitive salaries and good benefits. Alaska has been a leader amongst other states in establishing a defined contribution plan that accomplishes both. Our plan offers generous health benefits and gives employees the freedom to select a variety of financial options to manage their own retirement investments. It also gives Alaskans the right to take their savings with them should they decide to leave public employment. I’m glad we reviewed these important issues as a committee, and look forward to working with colleagues to address the liabilities Alaska faces in the future.